The best location in Breckenridge! Away from the noise and crowds of downtown, our home , situated on over half an acre, affords you quiet and privacy with easy access to all that Breckenridge has to offer! Commanding outdoor views of the Peak 8 slopes and Bald Mountain abound from inside our home, as well as outside while lounging in the outdoor hot tub. Please check the availability calendar first. We keep it updated daily, or as necessary, for your convenience. Our home is PET FRIENDLY! We've listed successfully with VRBO for over 10 years. Check our reviews and you'll see you can be assured of a worry- free experience. FREQUENTLY ASKED QUESTIONS: HOW LARGE IS YOUR HOUSE? -1280 square feet- large enough to comfortably accommodate six guests. Seven is the maximum allowed. -Generally no. You are welcome to call owner to make special arrangements. -50% of the fee is due upon reservation, guaranteeing your dates. The remainder 30 days prior to your arrival date. We prefer credit card payment, but checks are accepted. -your deposit will be refunded if and when your dates are re- booked. HOW FAR IS THE HOUSE FROM TOWN? -We're four miles from the town center. CAN (MAY) I BRING MY DOG(S)? -Yes. There's a $50.00 refundable pet cleaning deposit. Pets are to be caged if left unattended in our home, unless otherwise agreed upon. FAQ's Continued: HOW FAR IS THE HOUSE FROM THE SKI LIFTS? 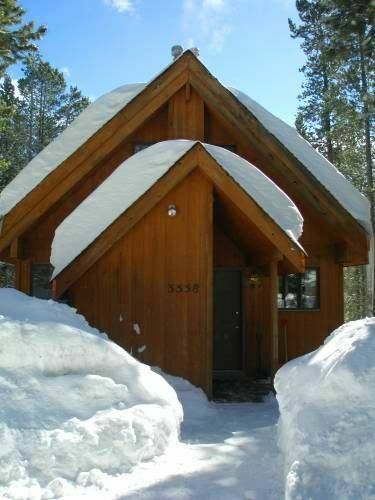 -Approximately 3.5 miles to the gondola parking lot. The free parking lot is closer to our house and requires a free bus ride to the gondola. We love Summit county and are happy to share our home with you! Colorado has always been a special place for us. After spending our honeymoon in Summit county nearly three decades ago, we've returned often for the beautiful summer weather, and in the more recent years, to ski. Additionally, our oldest daughter chose Summit county as her wedding venue last year. It's a great family place and our home blends the quiet peacefulness of our Peak 7 neighborhood with the charm and activity of downtown Breckenridge. -Outdoor Hot Tub! Professionally maintained by Rocky Mtn. Hot Tub Co. And you won't be sharing with your neighbors in condo 4A next door, because there is no next door! We're on over 1/2 acre! Relax and enjoy the silhouettes of the lodge pole pines against the star lit sky. Watch the distant lights of the snow cats as they move about and groom the slopes for another days skiing. Listen to the quiet! -Pet Friendly! Let us know what your particular needs are and we will work with you. -Plenty of off road parking for three vehicles. -Summit county's BEST housekeeping company! Our house is spotless and nicely maintained. Bathrooms are situated as follows: Full downstairs bath/ shower with separate entrance for toilet/bath, and another for the sink. Separate stand up shower stall in one of the downstairs bedrooms, for a total two showers. Toilet and sink upstairs between loft and master bedroom. Sit on the deck and enjoy the views! Basic cooking spices and condiments are stocked. We ask you replenish what you used for the next guest. Fully stocked for all cooking needs! Sun/ shade. Perfect for relaxing outdoors! Professionally maintained by the best service in Summit county. The water will be clean and warmed up when you arrive! Beautiful outdoor hot tub allows for panoramic views of the slopes and Bald mountain on this over sized half acre corner lot. Limitless stargazing too! You'll enjoy privacy and unforgettable scenery while relaxing! A beautiful neighborhood, friendly for leisurely walks, with trail heads as close as two blocks from our front door for easy hikes to scenic views of town and peak 8! And don't forget your laptop, because you'll love the high speed wireless Internet connection, provided by Comcast cable! Large capacity Maytag front load washer and dryer. Great location near the skiing area. The home was clean and had PLENTY of sleeping spaces if you have a large family. David was quick to respond to any questions we had. We had a great experience! We really enjoyed our stay. The house was perfect and well kept. It was in a beautiful location and we loved the hot tub. Exactly what we were looking for, for a ski trip. We had a great time staying at Heaven on Seven. Amazing location, clean, pet friendly and hot tub! The property was exactly as described. Plenty of space for our group. The house was clean & ready for us upon arrival. Hot tub was awesome! Very clean and well located! The home was well located to downtown Breckenridge. It was very clean and comfortable. The only thing we would change is have the hot tub in doors. Beautiful, rustic peak seven neighborhood. Our home is situated on over half an acre for quiet and privacy. Only three miles to gondola parking lot for peak 8 lifts.Views of peak 8 and Bald Mountain from our home. Downtown Breckenridge is less than four miles and our location allows you to avoid down town traffic when traveling to Frisco via Colorado route 9. Stay with us and you'll enjoy one of the best vacation values in Breckenridge! Your own home away from home! Please check the availability calendar. Nov 15-Apr 15 $230/night (no minimum) .. $1400/week. Apr 16 -May 22: $160/night (no minimum) .. $ 950/week. May23-Sept 6: $205/night (no minimum) .. $1250/week. Sept 7-Nov 14: $160/night (no minimum) .. $ 950/week. Dec 20-Jan 03: $300/night ................ $2000/week. Please add $125 cleaning fee to all rates.